They may not be speaking yet, but even the youngest environmentalists can make a green statement (or brown, depending on what they had for lunch) with this hilarious organic cotton infant BabysuitTM outfit . Deadpan and clever, "Ask me about my compost pile" is sure to provide the world with lots of laughter. Organic cotton printed with Soy inks. Made in India. Read about the benefits of Organic Farming. Ages 0 to 6 mos. Machine wash. If very cute and funny, but probably a little overpriced for a simple screen printed shirt. Made a nice gift though. This is such a cute onsie, and I can't wait for my baby to wear it once he's born. Everyone who I've shown this to loves it and has had a good laugh. The fabric is not super soft, but I like that it's organic! I really liked this onesie and wanted it, even though I think it's overpriced. Hilarious gift- no matter if the critter turns out to be a girl or boy! What else can be said about it? The baby onesie that says it all. For the price I expected a lot more. The material was like a thin Tee shirt and the screening had washed out and bare spots. Other than the novelty of the design I would have returned the merchandise. A sense of hunor for Baby! This is the second Uncommon Goods onesie I have given to celebrate a newborn infant, and they have been well-received, especially those with funny inscriptions! This was purchased as a gift for an eco baby shower. The gift was a hit! Although I bought this outfit for my sister-in-law's baby and have no direct experience with it, she assures me the above "pros" and "uses" are true! Cute and quirky! I have several friends expecting and I plan to buy all of them bodysuits from Uncommon Goods. The fabric was so soft and cuddly plus the gift was a hugh hit at the last baby shower. Unique present that makes both parents' to be laugh. 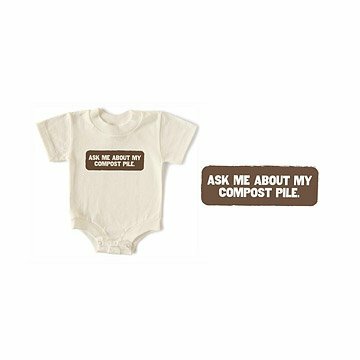 Clever one-piece infant suit with cute message, "Ask me about my compost pile". Made from organic cotton with soy ink print.